The AFL International Rules Series , Australia Vs Ireland , is to be played in Australia over the next two weeks . The Aussies playing host to the Irish , have compiled an AFL team of a variety of players . It includes two indigenous players , eg: Jake King , a rising star, Callan Ward new to GWS, a young leader , Brad Green , Melbourne Demons Captain , and old campaigner , Stephen Milne . There has been much debate as to the merits of this series . What remains irrefutable is , the Irish love it , players feel honoured to represent Australia , and fans enjoy the spectacle . Many will be at the Game on Friday night , wearing their football jumpers , jerseys , guernseys cheering either the Aussies , or the Irish to victory . Can the Aussies win , or will it be the luck of the Irish ? 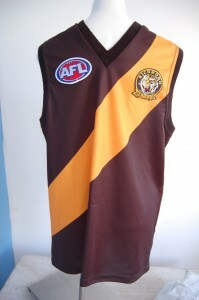 This entry was posted on Thursday, October 27th, 2011 at 8:41 am	and is filed under AFL, football jumpers, NRL. You can follow any responses to this entry through the RSS 2.0 feed. Both comments and pings are currently closed.